Yosemite National Park us one of the most beautiful places we have ever visited. We spent 2 nights camping in the park but could have easily spent longer. Our 2 nights were a little smokey due to forest fires in the area. Sadly forest fires seem to be an annual occurrence in the region so check before you go. Yosemite is a busy place especially if you want to stay in the park. Luckily we had done our research and booked a campsite well in advance. 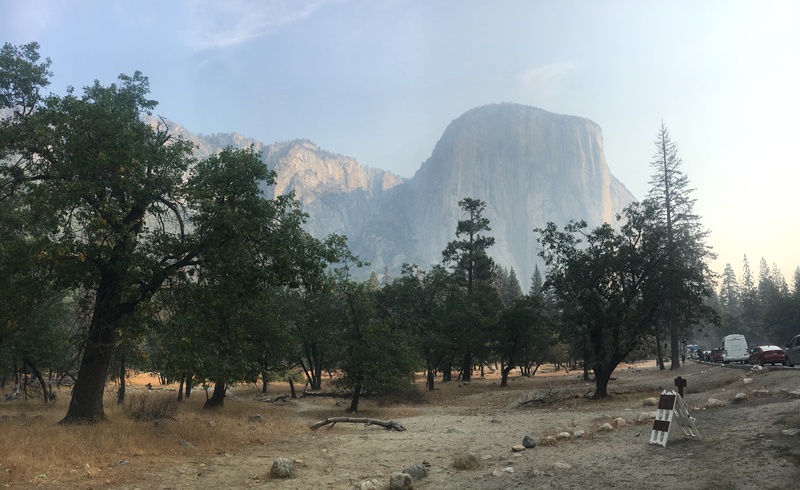 However, despite booking months in advance we could not get a site on the valley floor but managed to get one at Crane Flats about 20min drive from El Capitan. Tip: Book a campsite months in advance when the campsite availability is released. You can easily book it via the National Park Service website here. They release the dates slowly so if you want to stay on the valley floor keep an eye out on the website. The campsite was very basic, it had a few toilets with no showers and no hand soap (Bears). The individual sites came with a bear box, fire pit and picnic table. The bear box was strictly enforced by the rangers and there were lots of warnings about keeping food and anything with a smell including toothpaste and deodorant locked securely in the box. Make sure you double check all your bags, we found a hidden cookie in one of our bags. For 2 people from New Zealand and Scotland the thought of bears scared the hell out of us. Silly me booked a ‘nice peaceful and private site’ far away from other tents which left us feeling exposed to bears (and potential mountain lions which were sited recently in the area)… We didn’t see any bears but the peaceful site did treat us to plenty of deer and lots of squirrels. Tip: Lock EVERYTHING in the bear box provided and follow the rangers advice. If you have any questions there is an onsite camp warden/manager. We brought all our own food an snacks as there were limited options offered by a gas station at Crane flats. It is possible to get food on the valley floor which was handy for lunch and dinner after a big day walking in the park. We had a little camp stove and brought cheap pots, pans from Walmart. Tip: Plan your meals in advance, it is a long drive back to a supermarket. There are no fridges so all of our food was non-perishable. Many of the National Parks in the USA have a fee to enter them. This seemed strange coming from New Zealand where access to National Parks are free. On the plus side the National Parks service offer an annual “all you can eat’ pass. Although we were only in the USA for 4 weeks we brought the pass so we could access as many of the parks as possible. The pass allows for your car and 2x named people to enter the National Parks and cost USD $80. Tip: You can buy the America The Beautiful Pass online or from selected Federal Recreation sites. We choose to buy ours when we arrived at Yosemite to save on postage. When you arrive in the park you get given an information leaflet which includes a map. This helped us plan our day. As we only got one full day in the park we chose to do a number of smaller walks rather than one big walk. The walks we chose were also relatively easy and meant we could walk in running shoes rather than hiking boots. Even though we did easier walks, it is still very steep in some parts and we managed to walk 30,000 steps in one day! Tip: Arrive early into the Valley to get a carpark and then take advantage of the free shuttle bus that does a loop of the valley to save your feet for the walks. Yosemite is more than just the famous valley, on our way to our next destination Lake Tahoe, we were treated to amazing views along Tioga Road. We stopped at a number of beautiful spots and did a short walk at Tuolumne Meadows. Tip: Weather depending take a trip along Tioga Road and take advantage of different view points of park. If it is not already on your bucket list we would highly recommend you add it. We hope to return to this amazing valley one day!